Paris is known for many things: art, food, of course, the fashion. Speaking of fashion, Paris Fashion Week wrapped up a few weeks ago. 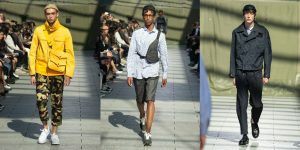 The week was comprised of the latest menswear collection consisting of distinctive themes, fabric selections and much more. If you are looking for a closer look at all the Parisian fashion you don’t want to miss this post. 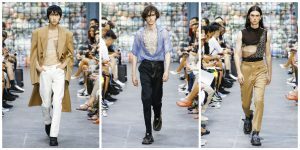 Overconsumption is the theme of the collection which the design duo illustrated through deconstructed looks which mimic a patchwork quilt. Fashion is known for making a statement especially when it comes to current events. 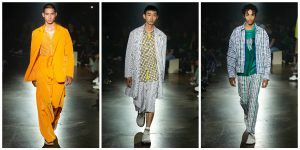 The collection is aptly titled “Survival Strategies.” which also found inspiration for the designers’ own mixed background. 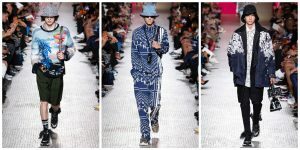 One of the things to highlight is the combination of vivid colors and various prints look throughout the collection. There are even solid looks for the guys wanting more of a subtle look. 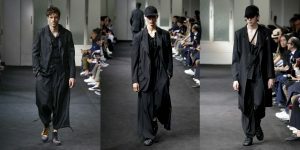 The runway show consisted of eight collections. 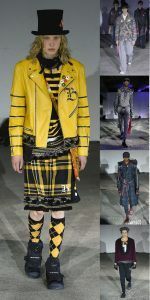 The theme was inspired the late 70’s cult classic film and 1965’s novel The Warriors. Looks were based by some of the famous gangs featured in the film and novel. 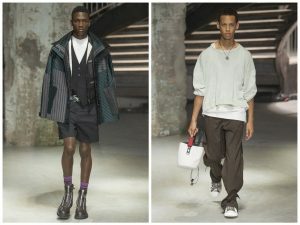 Designer Alexandre Mattiussi took the audience on a weekend trip to a cozy cottage in his native Normandy. 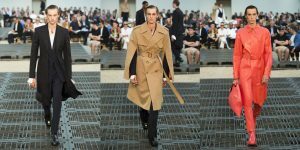 We really loved the different types of trench coats in various colors and lengths. The signature neutral color palette the label is known for was paired with splashes color on numerous designs. 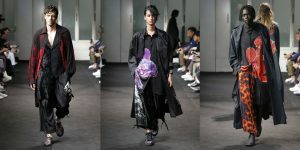 The designer was also quoted as saying that the style of this collection as “modern ukiyo-e,” which is a widely popular genre of Japanese art. 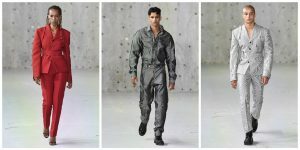 The collection utilized pop culture elements such as theme music from the theme from the ’60s sci-fi puppet show Thunderbirds and M*A*S*H-type army tent. The military influence can also be seen with the use of camouflage, holster bags, and vests. As fans of the late designer we still look forward to their latest collection each season. While there were plenty classic menswear elements (i.e. 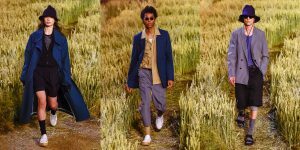 fine tailoring, and styling), but also attention-grabbing looks we have all come to expect from the label. Creative Director Kim Jones had toile de Jouy patterns made to replicate the fabric on the walls found in Dior’s first boutique in 1947. 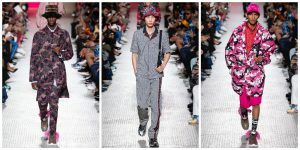 We can easily see this collection being worn by guys for a casual work look or hanging out with friends. 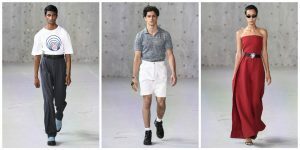 For those who may not be aware Creative Director Pierre-Alexis Dumas is also the great-great-great grandson of Thierry Hermès, who is the founder and namesake of the label. There is so much to pick up from this collection. We gravitated more to the looks that use brighter color from the chosen palette. Not only it is the last collection on our list, but the final show as well. 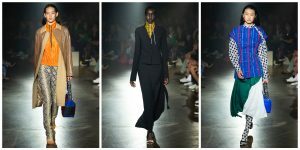 The collection included several womenswear selections along with color blocking, loose-fitting pants, and more. 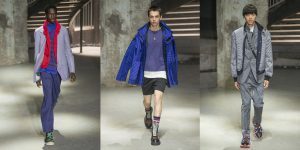 That’s it for Paris menswear. 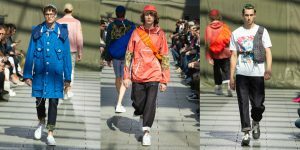 The Spring/Summer 2019 menswear schedule is heading back to the U.S. with New York’s selections. 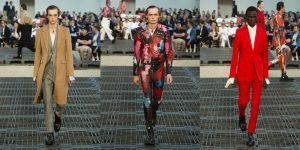 What was your favorite Paris menswear collection? Who stood out to you. 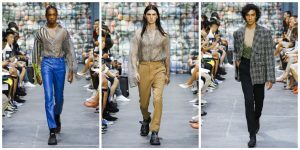 Have any predictions for New York Fashion Men’s this season? Let us know in the comments. 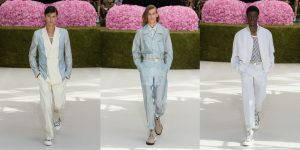 All images/information appear courtesy of Fédération de la Haute Couture et de la Mode & Vogue Runway.